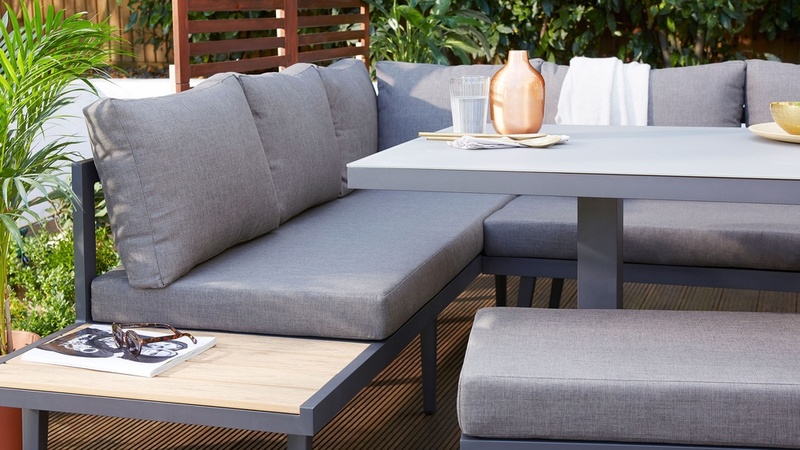 Have you ever considered a fabric dining bench for your outside space? If not, now's the time to start! 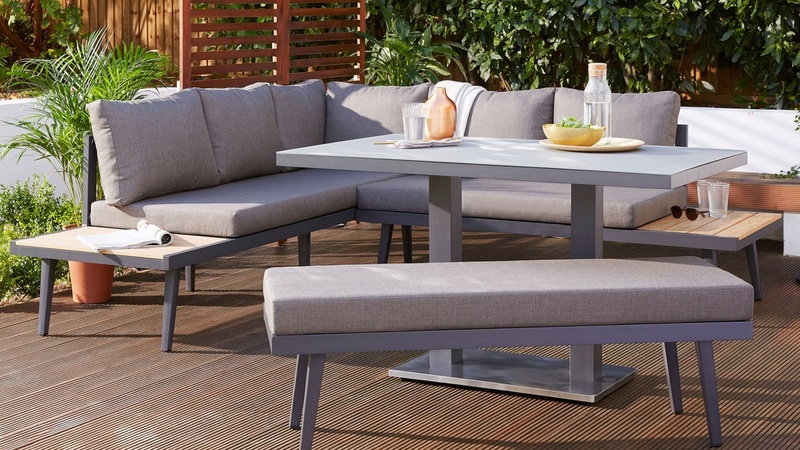 The Palermo Grey 2 Seater Garden Bench, part of our exclusive outdoor range, has been engineered with quality and durable materials so it has the look and feel of an indoor bench but remains practical for outdoor use. The melange fabric cushioned seat is as comfy as dining benches you'd find inside, with a showerproof cover and UV protection to help keep it looking its best for longer. 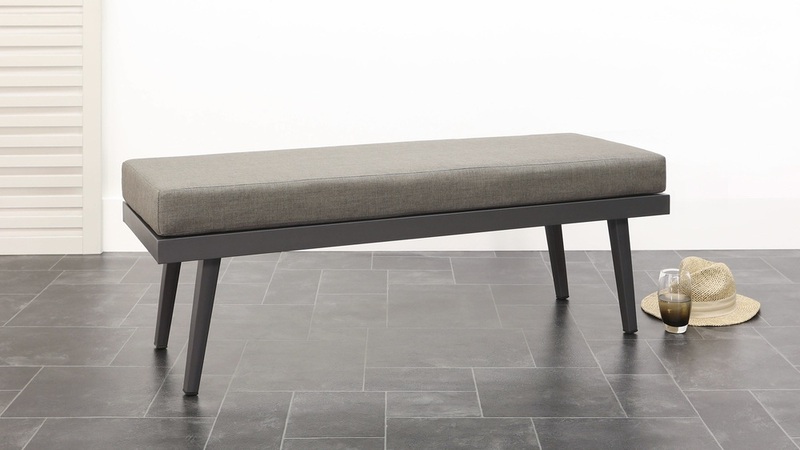 The aluminum frame of the Palermo 2 seater bench is finished in a grey powder coat. Aluminium is inherently non-rusting and lightweight, so you can easily pick these benches up and maneuver them. This is a key feature when it comes everyday use as guests will need to be able to move in and out of the bench seat with ease. 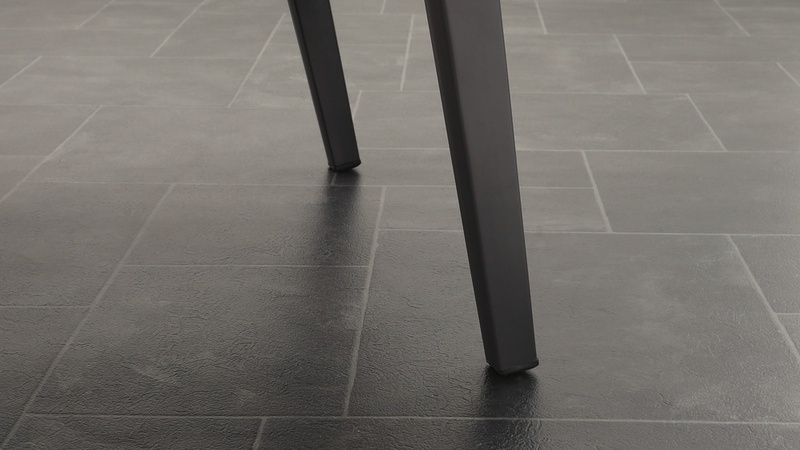 For this modern dining bench, we've taken extra steps to ensure its quality and durability by adding a anti UV coating. A premium feature for an affordable product, the anti UV coating will help to prevent the colour of the bench fabric from fading when exposed to direct sunlight for hours at a time. For more information on this, check out the ?Designer's Note? located further down this page. 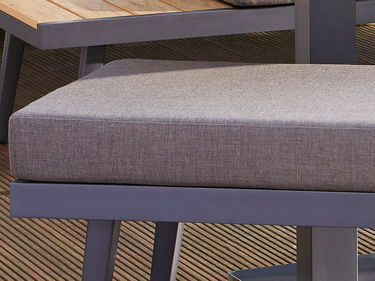 The fabric used for our range of outdoor benches is also showerproof, which means that light rain or moisture will not be absorbed into the material. This is a key feature for outdoor furniture as, during those light summer showers, you don't have to take the cushion in every time. It also means that spills are easy to clean as they will just roll off. 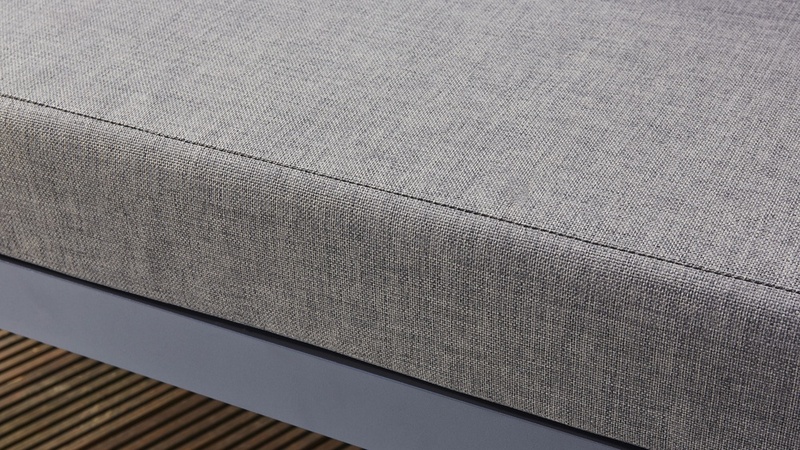 The melange fabric used for the Palermo bench not only looks like an expensive, premium finish, but it also helps to hide marks on the surface. This makes the backless bench both low maintenance and easy to clean. 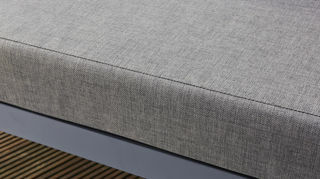 The foam and fibre filling used for the bench cushion is the same foam density that we use for our interior seating. 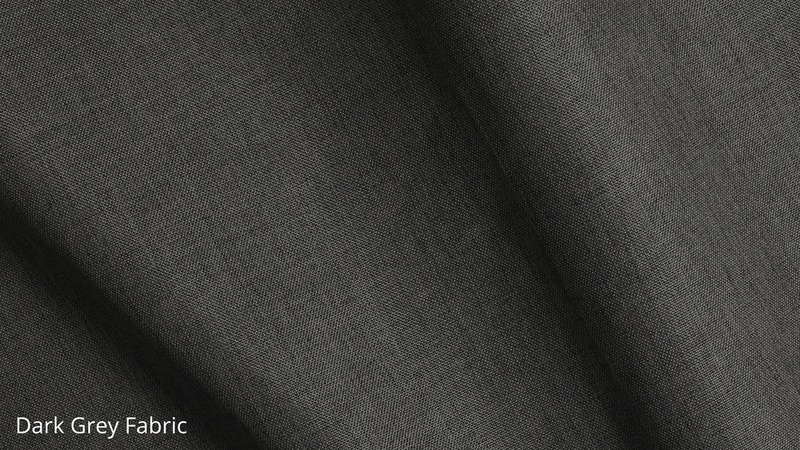 We've also added an extra layer of fibre for a softly wrapped look, all to offer you an interior level comfort in an exterior setting. The seat cushion is fixed to the frame with velcro tabs, meaning that it can easily be removed for cleaning and storage. All of the materials used for this backless bench are Fire Retardant (FR) which means they are incredibly safe for use around your friends and family. 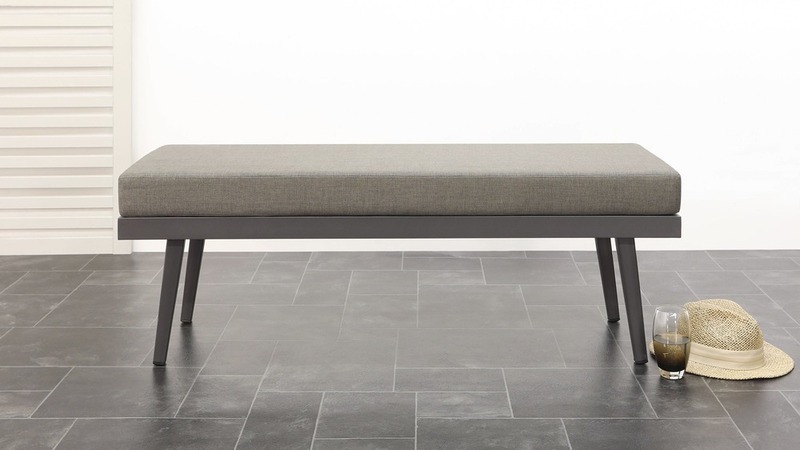 To complete the look, why not style this bench alongside the coordinating Palermo grey right-hand corner bench piece. 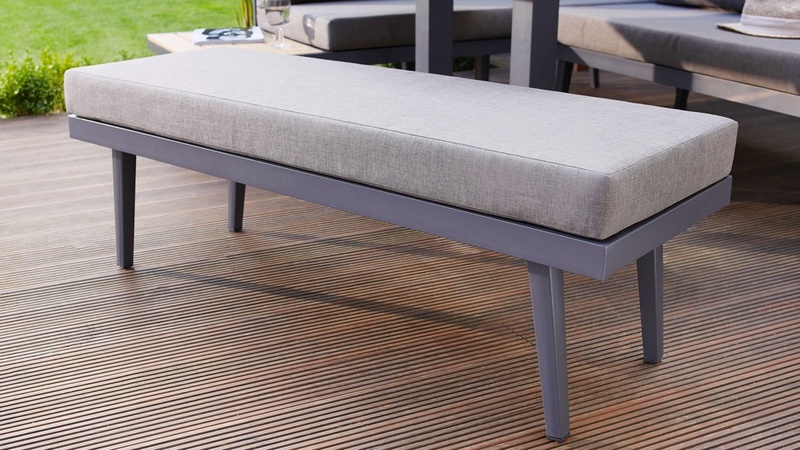 We also have a slighter larger version if this bench, the Palermo Grey 3 Seater Outdoor Bench. Practicality: by choosing to construct the bench with an aluminium frame, we were able to keep the bench sturdy and supportive yet lightweight and easy to move. This is such a practical feature as you can easily lift and manoeuvre the bench and then tuck it in or out when needed for versatile seating. Style: We’ve then added a sleek grey powder coated finish to the aluminium frame to make it as good looking as it is practical. The powder coat gives the Palermo bench a matt appearance, helping to accentuate the contemporary look of this modern garden bench. It’s really easy to clean and maintain too! Comfort: last but not least is comfort. We truly believe your garden should be and extension of your home, and that’s why we’ve made the bench cushion the same foam and fibre density to what you’d find indoors. This is so friends and family can really sit back and relax in your garden setting, enjoying the tasty food that’s just been served.